We know almost everything about the upcoming 2016 Ford Focus RS, except the price. According to what looks like a Ford configurator website still in QA testing that is very different than what is found on Ford.com, the hottest of Focus hatches will have a starting price of $35,730. A fully loaded car will set you back $42,275. 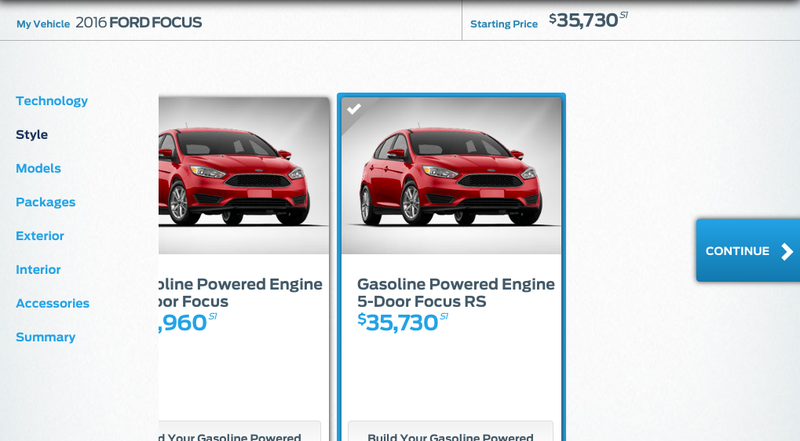 However, unlike the regular Ford page that only allows you to select a Focus ST.
Once you select the RS the code gets a little weird and no images appear, but you can select a variety of options including navigation, sunroof, and 19 inch forged alloy wheels and Michelin Cup tires for a whopping $1,990. Tick all the boxes and you will cross the $42,000 mark. That is a lot of cash for a Focus hatch, but it seems RS pricing is in line with the Subaru WRX STI, Mini Cooper JCW, and Golf R.
At this point the only question that is left unanswered is...what is this beast like to drive? What could that mean? We have an email in to Ford to see what’s up.